Party animals abound in Nieu Bethesda. Where else in South Africa could you find yourself bidding for a bull at a stock fair, making merry down a middelmannetjie path on your MTB, snagging a monster trout from a rushing river, catching a Saturday night burlesque show, downing single malts from the Scottish Highlands and watching world champion sheep shearers snip away – all within a week and a few hundred klicks apart? 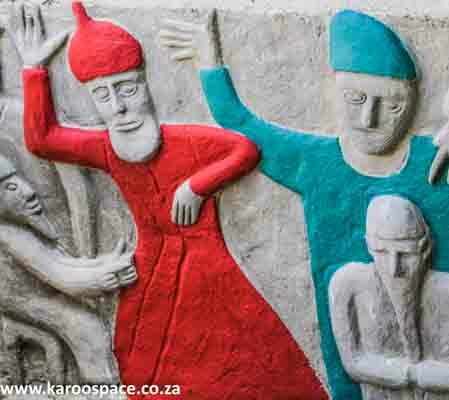 The Eastern Cape Karoo is a jol of note – if you know where to go. Join us – we know the way. The Camel Yard at The Owl House in Nieu Bethesda. Middelburg is essentially a farming centre these days, but back in 1901 it was an Anglo-Boer War hotspot. On the outskirts of town on the Richmond road, you’ll see a stone memorial at the foot of a little koppie on the left. The stone bears the etching of a riempies chair, a symbol of two men who were seated here back in October 1901 and executed by firing squad. At Jagtpoort on the lip of the Lootsberg, our serious padstal shopping adventure begins. We need padkos, in the form of droewors, biltong, cheese and ginger beer. Throw in a pack of koeksusters for the soetbekkies amongst us. An Eastern Cape Karoo padstal speaks volumes about who lives here, what they farm and what they make. 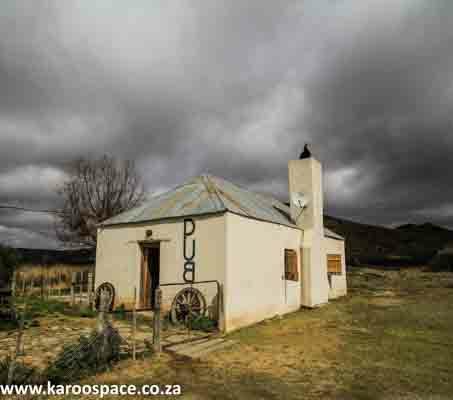 Die Ramstal – one of the Eastern Cape Karoo’s most famous watering holes. Soon enough, we’ve veered off the N9 and find ourselves on the outskirts of Nieu Bethesda village, home of the Owl House, the Camel Yard and some pretty fine craft beer. But it’s also about running into some really good visiting musicians, hanging with villagers in a local pub called Die Ramstal, staying on guest farms deep in the Sneeuberg range, fossil hunting, fossicking in the hills, book-worming and generally disconnecting from all that stuff back in the city. Some days later, we’re in Graaff-Reinet, arguably the ‘prettiest Karoo town in the world.’ They call it The Gem and, if you catch it just right in the sun as you look down from the rocky heights of the Camdeboo National Park, it really sparkles. Graaff-Reinet does its tourism right. They have a world-class hotel called The Drostdy, a tourism school that produces success stories, tour guides who know their business, a hospitality association that really rocks, a guest house collection of note, an interesting lifestyle festival roster and a museum complex that tells the town’s story very well. 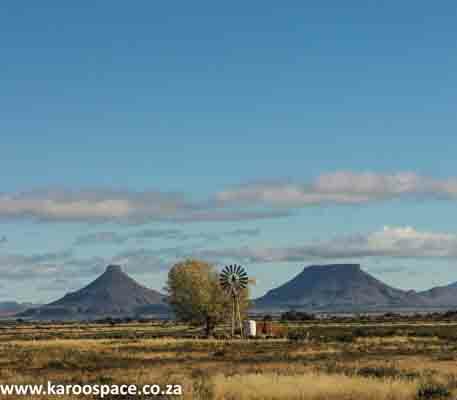 Willowmore, at the gateway to both the Eastern Cape Karoo and the Baviaanskloof. It’s just more than 50km south on the N9 to the village of Aberdeen, but it could be a world away. In fact, it’s worth checking in at a guest house like Pagel’s and stretching our legs on an architectural tour of Aberdeen. If you guys get stuck over coffees at the Blue Door Café, we’ll meet up later under the gargoyle over at the magistrate’s court. 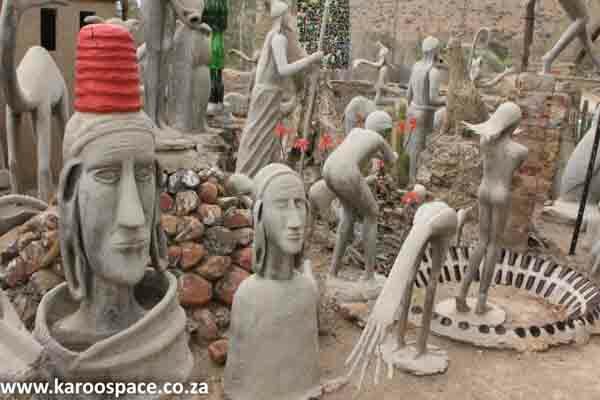 Looking for gargoyles, especially terracotta ones, in the Karoo? Then head straight for Aberdeen. And let’s not even start talking about the old gambling den legends over at Carmen Villa, because I want to make a quick detour off the highway to Rietbron and show you the place where ‘peace and quiet’ was invented. Go to Jansenville and you’re in the middle of Mohair Country. Willowmore, however, is a goat of a different colour. It’s Biker Central, the convergence of large groups of leather-clad, helmeted riders of both sexes who are (a) heading north into the open Karoo vastness or (b) heading south into the Baviaanskloof Wilderness. 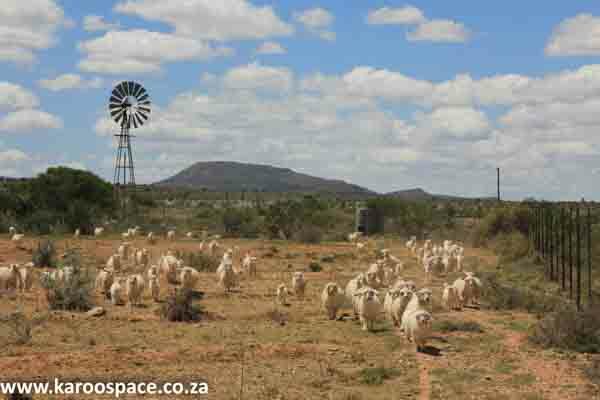 After something tasty at Sophie’s Choice we take on the single track cement road eastwards, heading for Steytlerville and right into the heart of Mohair Country. We land at The Verandah restaurant for lunch, take a walk through the Pegasus Early Motoring Museum, have street-chats with some grizzled old Wild Hogs from the South Coast who gather around their all-terrain BMW motorcyles, wonder at the family crests on the main road (Is there anywhere else in the world that has this? I don’t think so) and check in at the Karroo Theatrical Hotel for the hilarious Saturday night follies. The next day after breakfast, we finish this route at the aptly-named Mohair Museum in Jansenville. By now, our vehicle is awash with scarves, booties, knee blankets, jerseys, socks, gloves and beanies – all made from the ‘diamond fibre’ fleece of the Angora goat. At the Noorsveld Padstal outside Jansenville, we buy more mohair goodies. 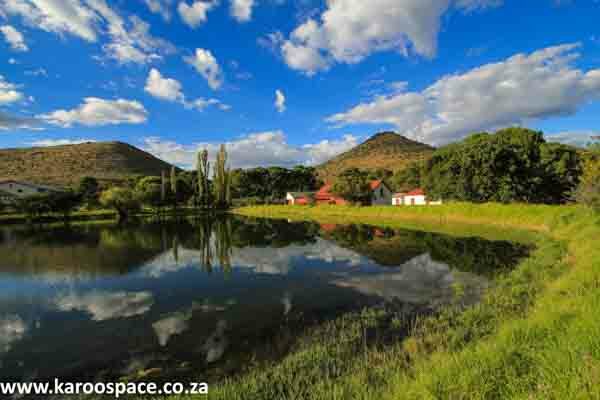 Huntly Glen Guest Farm deep in the Baviaans River Valley outside Bedford. If you’re a sports fan, this trip could begin with a Saturday game of country cricket over at on Wheatlands Farm. In fact, if matters become jolly at the after-braai, let’s see if owners Arthur and Di Short have room at their old feather palace of a guest house. In Somerset East the next day, we pop in at the Old Parsonage Museum where we find an enviable collection of Mazawattee Tea canisters, a Flora doll with a ceramic head and mohair locks, a tin that once contained Karoo Freckle Cream and a door pierced by an assegai hurled in anger during one of the Frontier Wars. And that’s just for starters. We’ll talk about the historic ghosts another time. Across the N10, we drive into Bedford village with its densely treed lanes and fantastic rose gardens, just in time for their monthly stock fair. The village vibe of Bedford. Who’s Uncle Aubrey? How did he bid? We saw no one raise a hand or an eyebrow. Ha. That’s the wondrous and secret thing about the Bedford Stock Fair. You have to know your way around a country auction. After lunch at the Village Farm Stall, we’re off to see Ernest Pringle’s butterflies on Huntly Glen Farm deep in the nearby Baviaans River Valley. He owns the largest private collection of lepidoptera in the country. Ernest is also a descendant of pioneer Thomas Pringle, who brought his party of eager Settlers into this wild and wooded valley nearly 200 years ago. 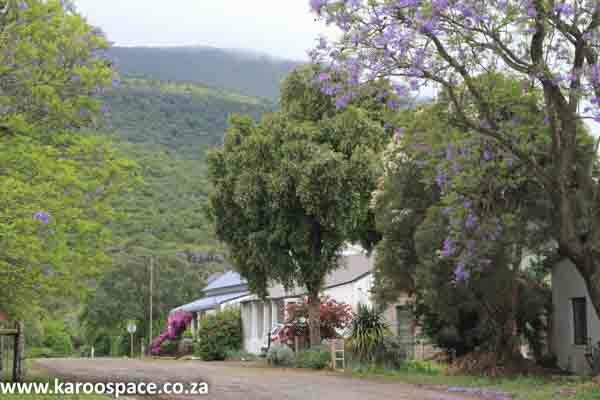 Afterwards, on a slow, winding and scenic road we head for Tarkastad, and our overnight lodgings at Blanco Guest Farm. If you’ve stayed at one of those delicious old family establishments in the Drakensberg like, say, Cathedral Peak Hotel, you’re going to love Blanco to bits. 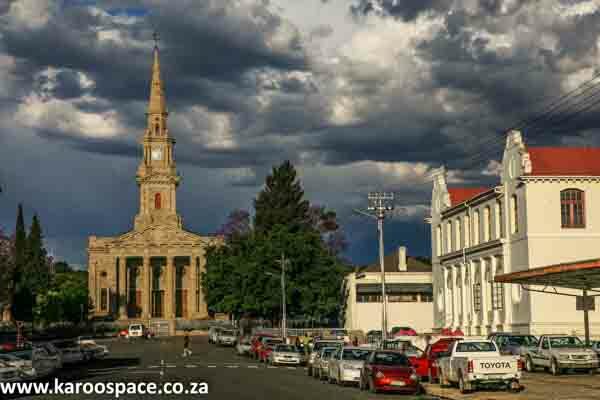 Downtown Cradock as the rainclouds gather. This trip begins in our home town of Cradock, and we’ll join you for supper at the Victoria Manor Hotel. A word to the wise, however: the plates are often hot, so bring your napkin to the buffet table. Waking up in one of the Antrobus family Tuishuise is a vintage Karoo experience, followed by the kind of hearty breakfast you’ll want to linger over. But we have to hurry, because I want to show you some lions – this time up at the Mountain Zebra National Park. No one had seen a free-roaming lion in this part of the Karoo for nigh on 130 years, so when two males (from Welgevonden Game Reserve in Limpopo) and two females (from Kwandwe Game Reserve in the Eastern Cape) arrived back in April 2013, there was much excitement. We’re very proud of our national park, and once you’ve done the Rooiplaat Loop with me, followed by some lunchtime lamburgers in the restaurant, you might well agree. Teebus and Koffiebus, iconic hills between Steynsburg and Middelburg. 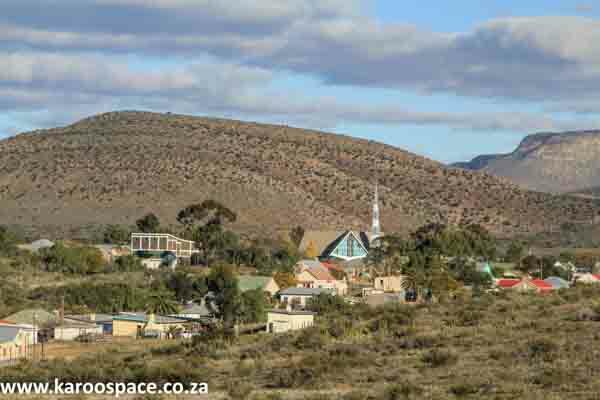 In the afternoon, we meander up the R390 to the little town of Hofmeyr, stopping off for snacks and stuff at the Karoobos Padstal, heading on in the direction of Steynsburg and then turning west to Schoombee. You’re about to meet a great gang of people who farm with beasts, crops and travellers. Here’s Riana and Adrienne Southey from Hillston, Pierre van Vuuren who produces great kudu salami, Rob Southey who shoots excellent images and Mike and Candy Ferrar of Mt Melsetter Farm. After all the feasting and carrying on, it’s time to haul out the mountain bikes and get some wheels on the veld. The Great Karoo Cycling Trails, headquartered at Mt Melsetter, were designed for groups of riders who like to smell the bossies, meet the people and revel in the grand landscapes on offer. They offer a choice of three routes that include stop-overs at Karoo farms and guest houses, where the dinner tables groan and the open wine bottles await after a 35 – 60km traverse over some of the most epic, wide-open spaces you will ever encounter. 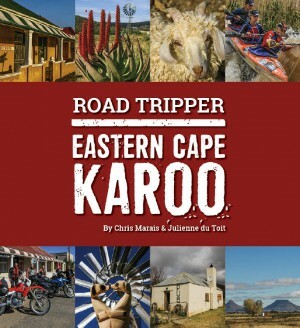 The Road Tripper: Eastern Cape Karoo by Chris Marais & Julienne du Toit is more than a tourist guide – it’s a traveller’s companion. Complete with a route map and essential information about what to do, where to eat and where to stay, it is also a window into life in this great region of the Karoo. Order both the printed version HERE and the Ebook HERE. I have promised myself to take a tour through the Karoo one day, but could not decide where to as I am not familiar with the area. After reading this, I am certainly going to do it – hopefully this winter. I have for years traveled to Barkly East and Rhodes to fish for trout, staying often at Mt Melsetter midway between Middelberg and Steynsberg. Here the river that the red-painted steel highway bridge crosses is invariably dry, but i have taken a series of images over the years from the same spot of it bone dry, flowing and even in roaring flood. If you want them I will happily send them to you.